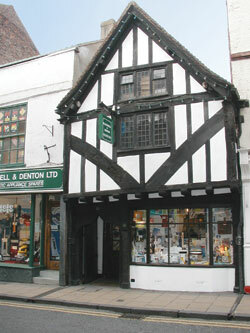 A two-storey building of timber-framed construction, jettied and gabled to the street, and probably of sixteenth century date. At the back is a brick extension which may be a replacement of an original framed third bay. The house was much restored in this century and many of the timbers are modern. The ogee-arched head to the main doorway is not original, though the two door-posts and the north-west corner post are. 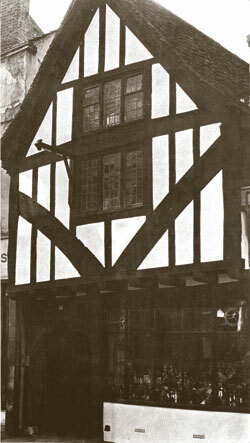 Though many of the timbers are modern, this gabled house is probably of sixteenth century date. It stands in the street of the colliers. Medieval colliers were not coal-miners, very little pit coal being dug before the sixteenth century. Medieval fuels were charcoal, peat and wood. Colliers were the makers and sellers of charcoal. In the will of Thomas Cator, dated 1491, there is mention of a house called “Le Bere”. Later, in 1575, it is referred to as “the messuage sometyme called the Beare and nowe the signe of the Bore, lyeng and being in Colyergate”.